Please scroll down to see what else I've been creating - Happy Stampin'! All prices EXCLUSIVE OF SHIPPING which is at BUYERS EXPENSE. 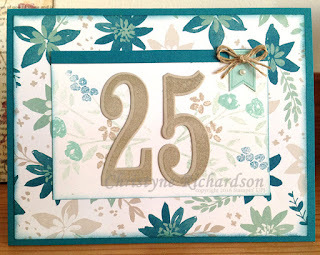 So, of course, anytime I've used the Number of Years Stamp Set and Dies, I've used the number 25. He may well end up with a ½ dozen or more anniversary cards - LOL! Although...I suppose I could just show him the selection and then let him choose one to give to me - teehee! I started off with a base of Island Indigo and added a layer of Blooms & Bliss DSP (yes, again). Since these cards are created in advance, I create several of them at one time. I only ordered Blooms and Bliss DSP and Pop of Pink DSP when I placed my pre-order and at the time I was creating my most recent series of cards, these are all I had. Stay tuned though...there's more (different) DSP on the way! I used some image from the Number of Years Stamp Set for the image panel on the card and then stamped the numbers in Sahara Sand Ink on Sahara Sand Cardstock before cutting them out on my Big Shot. On the inside of the card, I sponged around the edges and added a strip of the same Designer Series Paper as I used on the front of the card. 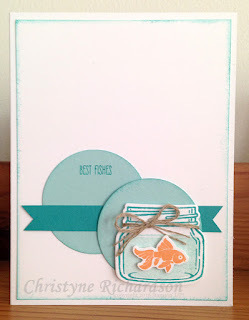 Popcorn Box Thinlits Dies by Stampin’ Up! I haven't ordered mine yet, but you can bet it'll be on my next order and featured in some of my upcoming classes - this popcorn box die is just SO cute! OH happy day! There's a FISH!!! I don't know if you remember, but a few years ago, there was a single stamp image with two little fishies in a fishbowl. There was no sentiment, so you could make the card be anything you wanted it to be! I was so sad when that little fish retired! I had originally bought the stamp for my son, so he kept it and every once in a while I still borrow it. Isn't he just the CUTEST? I love him! And the Best Fishes Sentiment? Perfect! Now that I've finally got my hands on this set (I KNOW! It wasn't in my first order - what was I THINKING??) you're probably going to see a LOT of it! For today's card, I used the sketch over at Freshly Made Sketches. 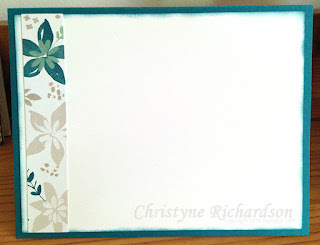 I started off with a base of Thick Whisper White Cardstock and added a layer of regular Whisper White cardstock that I sponged in Bermuda Bay Ink. The circles were punched out using the 2" circle punch and they were sponged too. I stamped the jar in Bermuda Bay Ink and the "water" was stamped in Pool Party which I stamped off before adding it to the image. Mr. 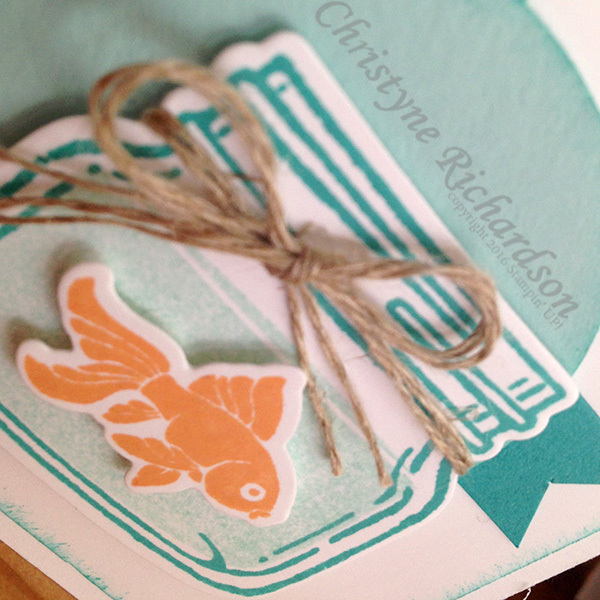 Fish was stamped in one of the NEW In Colours - Peekaboo Peach - and I cut him out using the die and my Big Shot. You can get Jar of Love as a bundle which includes the stamps AND the dies for the Big Shot - it's a GREAT bundle with lots of dies and images! When you buy both the stamps and the dies in the bundle, you'll save 10% over the cost of buying them separately. Everything was stacked up towards the bottom of the card and...DONE! Clean and simple!